One of our miniature hereford herds. We own a small farm in Broadway, Virginia. While traveling through the state of Texas several years ago, we came across a farm that had miniature livestock. Not knowing at the time what exactly they were or how they could be used, we thought to ourselves that one day we would like to own a small farm with that type of livestock. 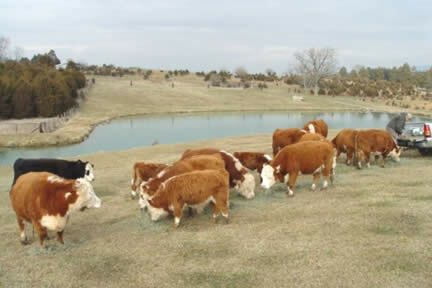 After researching miniature cattle, we decided Miniature Herefords were right for us. Having a small farm we are able to maintain more minis on our property than if we had full size Herefords. Also because they weigh much less than a full size Hereford, they are not as harsh on the land or facilities. We strive to keep a herd of approximately 45 head of Miniature Herefords and beginning in the spring of every year, we have plentiful calf crops. We have made efforts to acquire miniature Herefords who originate from different bloodlines from various other breeders for our breeding program. Our goal is to produce and maintain a 0000 to a 000 (37 to 40 inch) frame size Hereford without sacrificing quality or conformation. The majority of our minis have been dehorned. We enjoy interacting and working with our cattle on a daily basis and have found much pleasure and rewards from owning these great little animals. We welcome you to Contact Us for more information regarding our Miniature Herefords and thank you for checking out our web site.